Unexpected guests. A frozen filo dough in the freezer, some tomatoes, herbs and cheese made a perfect hot hors d’oeuvre while I stalled the dinner menu off a bit till I figured out what to make. I made a big pizza with tons of different toppings. 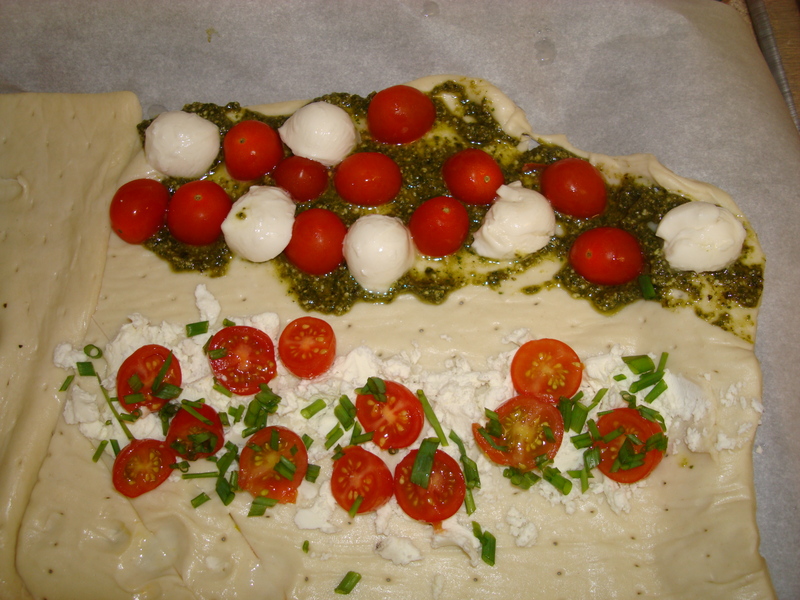 First, I spread one side with pesto I also had frozen, added cherry tomatoes and baby mozzarella balls. On another side I put goat cheese with sliced cherry tomatoes and parsley. You can really just put what ever topping you want. I was thinking of making one with pancetta and a creme fraiche (or sour cream) with carmalized onions-making it like a tart flambe, Alsatian style. I would like to make just a simple Margherita with tomato sauce and cheese. You can just add left overs and call it a day. I’m sure cut up chicken would be lovely. You could Mexicanize it and add sautéed shrimp with cilantro, garlic and lime. The filo dough makes a great vehicle for anything. It’s an easy bruchetta! Enjoy!